Animal Wildlife | Guppy | The guppy (also known as the millionfish) is a small colourful species of freshwater tropical fish that is found naturally in the rivers and lakes of South America. There are nearly 300 different types of guppy spread throughout Barbados, Brazil, Guyana, Netherlands Antilles, Trinidad and Tobago, and Venezuela. The guppy is one of the most popular types of aquarium tropical fish in the world as they are small, colourful and easier to keep than many other species of fish. The guppy generally lives from 3 to 5 years old in captivity and slightly less in the wild. The guppy has been introduced to most other countries mainly as a method of mosquito prevention as the guppy eats the mosquito larva before they are able to fly, therefore slowing down the spread of malaria. The guppy is an extremely colourful fish and often displays elaborate patterns on it's tail fin. 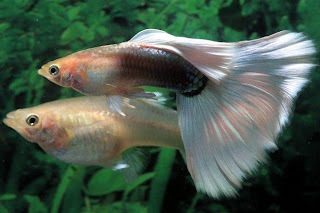 The female guppy and the male guppy can be identified quite easily as the female guppy has a small, patterned tail where the tail of the mail guppy is much longer and generally has fewer markings. 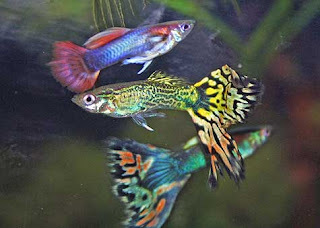 The female guppy also tends to be larger in size than the male guppy. The guppy gives birth to live young, meaning that the eggs are first incubated inside the female guppy and hatch there too. The incubation period of the guppy is about a month after which the female guppy can give birth to up to 100 baby guppies, which are called fry. As soon as they are born, the guppy fry are able to eat and swim around freely. 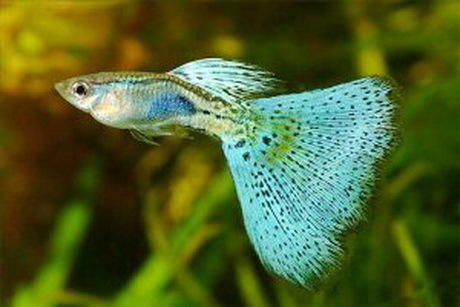 The guppy fry are also able to sense and avoid danger which is important when around older guppies as they often eat the fry. The guppy fry have matured in adult guppies within a couple of months. After mating just once with a male guppy, the female guppy is able to give birth numerous times. The female guppy stores the sperm of the male guppy inside her and just hours after giving birth to her fry, the female guppy is ready to become pregnant again and will do so using the stored sperm (hence why the guppy is often called the millionfish). The guppy is an omnivorous animal and eats a wide range of organic matter that is available in the water. The guppy mainly feeds on algae and brine shrimp, and often eat particles of food from the water that have been left by a larger fish. The guppy has many natural predators in the wild (and in tanks) mainly due to their small size and their elaborate fins often attract unwanted attention. 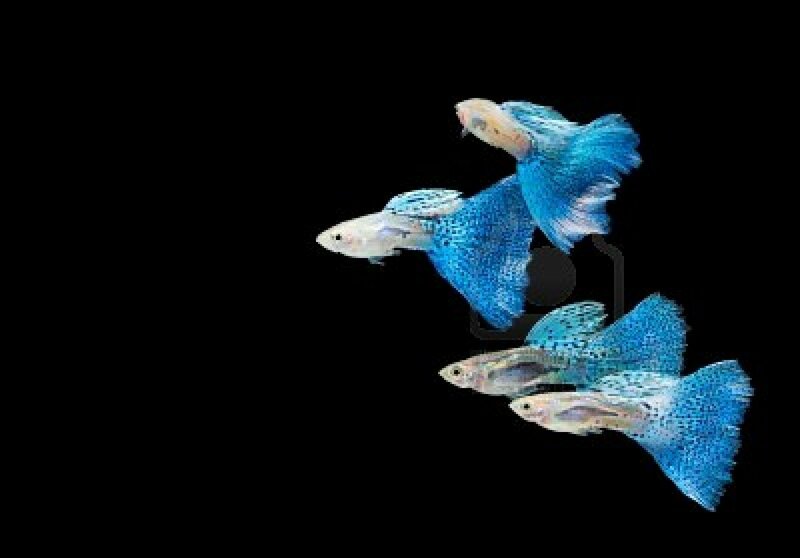 Birds such as kingfishers and larger fish are the primary predators of the guppy, so naturally, guppies that are kept in a tank should be kept with other very small fish to prevent them from being eaten.